I've been playing with making a "Galaxy" effect, but it is turning out to be more difficult than I had imagined. I always want to make the effect look just right, but I haven't managed to get it to appear and move correctly yet. I thought I was crazy, but after a discussion with Jopsy Pendragon, I now believe I've bumped into bugs in LSL. I've got to take another approach to this particular design. Back to the drawing board! 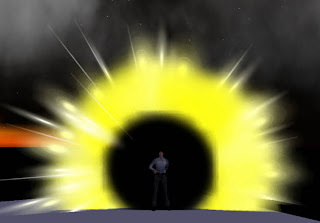 Eclipse is perhaps the most amazing Second Life particle effect ever (pictured). Just wear it and suddenly a massive total eclipse of the sun appears around you. The corona boils yellow and white flames, while you remain in the dark, black core. Like some of my other effects, you'd better be careful where and when you use this one! Starry is a very subtle effect, in which twinkly stars slowly appear in your vicinity. They don't move and gradually fade away. StarMaker is the installable version of Starry! Instead of wearing it, you install the emitter in your site, click to start and those subtle stars appear and fade. The effect really changes the look and feel of the area. I think this one will be very popular, since several were purchased immediately after I placed them for sale. Snower Personal makes snowflakes land gently around you. I had thought people only wanted snow to place on their land, but several folks asked me for a personal version. Some people just can't get enough snow! Fireworks Spray is my first attempt at fireworks. 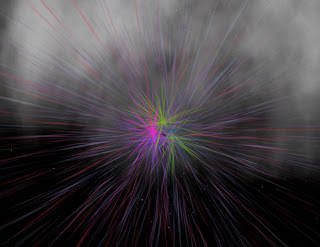 Just place the emitter in the sky and touch for five beautiful minutes of multicolored fireworks explosions. It's derived from the fireworks I provided for a benefit concert in Furumachi last month. Make sure you watch the show at night! You'll find these items at the store marked with a "New Product" sign. Enjoy! As always, please provide any ideas or suggestions for new effects. Griefing Attack at Burning Life? More from Rezzable / Greenies ?